BOLTON’S Kelly Tidy set Great Britain & Ireland on the road to a two point victory in the Curtis Cup from the United States on a thrilling final day at Nairn. Birkdale and Dunscar. was three down after six holes against Austin Ernst to win 2&1 and put the first point on the board and square the match. Amy Boulden, Holly Clyburn, Charley Hull all won and before Stephanie Meadow clinched the match – the first time they won the biennial event since Killarney in 1996. Bramhall’s Bronte Law went one up with a birdie at the long second against Tiffany Lua before losing by two holes but by then victory had already been achieved. The US were bidding to win for an eighth successive victory and this was first time since 1956 that they lost after leading into the final set of singles. The Ryder Cup, Walker Cup, Solheim Cup and now the Curtis Cup all now rest on this side of the Atlantic. BOLTON’S Kelly Tidy and Bramhall hot-shot Bronte Law scored crucial points as GB&I gave themselves an outstanding chance of winning the Curtis Cup for the first time since Killarney in 1996. Team captain Tegwen Matthews’ squad of eight players took this afternoon four-balls programme by two points after losing the morning foursomes by one at Nairn. That means that the United States’ lead has been cut to a single point with only tomorrow’s eight singles to come. The Americans have won the biennial contest for the last seven times and they had looked to be well on their way to yet another victory until the tide started to turn – miserably wet in the morning but perfect conditions in the afternoon. All the GB&1 I players were stars in the afternoon heroics but a special mention to the two winning partnerships. Holly Clyburn and Tidy won the lead-off four-ball by one hole with three-under-par figures against Amy Anderson – her first defeat in four matches – and Emily Tubert. Stephanie Meadow and Pamela Pretswell finished strongly to beat Erica Popson and Tiffany Lua 2&1. And teenagers Leona Maguire and Law who halved with Brooke Pancake and Austini Ernst, two of America’s top college players. REGIONAL duo Kelly Tidy and Bronte Law played a major part in helping Great Britain and Ireland recover from an opening day drubbing by the United States in the Curtis Cup at Nairn. Tidy, from Bolton, teamed up with Amy Boulden to beat Lindy Duncan and Lisa McClusky 3&2 in the fourball matches and Tidy, from Bramhall, and Holly Clyburn despatched Brooke Pancake and Erica Popson 2&1 to reduce the US lead to two points going into tomorrow’s matches. Meanwhile, US captain Pat Cornett ended up on crutches after breaking her ankle in a cart mishap. The 56-year-old professor of medicine was a passenger when the cart crashed into a grandstand near the first tee after lunch. After her team won all three morning foursome matches, she was taken to a hospital and put in a cast. A high quality field of more than 80 players will contest the English senior women’s strokeplay championship at Shropshire club Shifnal Golf Club, on June 19-21. The 54-hole championship, to be played on the highly regarded parkland course, has attracted entries from across the country with 25 counties represented by the players. Three past champions – Roz Adams of Surrey, Sue Dye of Cheshire and Janet Melville of Nottinghamshire – are among the senior internationals taking part. Other high profile competitors include British senior champion Felicity Christine of Surrey and Caroline Berry of Cheshire, a past winner of the English senior amateur title. The event has also attracted a strong contingent of local players, led by the Shropshire senior champion, Sue Pidgeon of Wrekin, and fellow senior county players Ros Moor (Bridgnorth), Mair Robinson (The Shropshire) and Olive Brown (Shifnal). Olive is one of four representatives of the host club, alongside Jan Sheargold, Jill Adams and Ann Peters, whose daughter, Alex has played for the England girls’ team. The championship is played over 54 holes, with the whole field playing 18 holes on each of the first two days. After 36 holes the top 36 players plus ties will qualify for the final 18 holes on the third day. The championship also features an over 65 prize and a county team trophy which promises to be keenly contested. The prize is awarded for the two best scores from each county after 54 holes. The Pleasington member, whose family own Hart Common Golf Club, finally shrugged off the tenacious Sophie Powell, from the host club, at the second extra hole. Earlier, Catherine beat Amelia Taylor by one hole in the semis as Sophie gained the prized scalp of England player Nicky Foster, from Pleasington, 2&1. The Challenge plate was won by the host club’s Donna Barnes who dispatched Hollie Muse, from West Lancs, 2&1. THERE will be a new Lancashire Women’s champion at Manchester tomorrow as all four semi-finalists have never won the competition before. Host club player Sophie Powell will play Nikki Foster, from Pleasington, in the first semi final and in the second match her clubmate Catherine Roberts will take on Amelia Taylor from St Annes Old Linkswho beat 2010 champion Bethany Garton 3&2 in the quarter-finals. CHORLEY teenager Emily Taylor has scored the biggest win of her fledgling career by sweeping to the Irish Women’s Open Amateur Championship by three strokes at The Island in County Dublin. St Annes who finished fifth in the recent English Women’s Amateur Championship at Royal Birkdale, started today’s third and final round a shot behind leader Gillian O’Leary from Cork. But Gillian took 80 shots for a total of 14-over-par 236 and 17-year-old Emily, with a 76, was able to make up the leeway and finish three shots ahead of joint runners-up Mary Dowling, from New Ross, a past Irish matchplay champion. 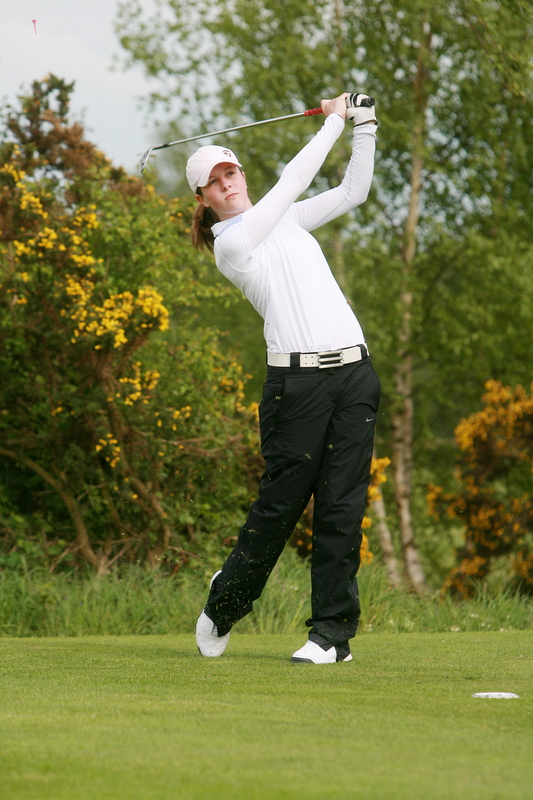 Emily, a former member of Chorley Golf Club, will go for a big strokeplay double at St Andrews thisweekend in the St Rule Trophy – won in the 1990s by Annika Sorenstam – over the New and Old Courses. HOSTS Cheshire dominated Northern Counties Veteran Ladies’ GA Championships at Ringway, writes GEOFF GARNETT. Bromborough international’s Caroline Marron won the strokeplay qualifier with 77 and the top nett score of 72 came from Lancashire’s Jennifer Adams, of Pleasington, by a stroke from Yorkshire’s Sue Mayman. 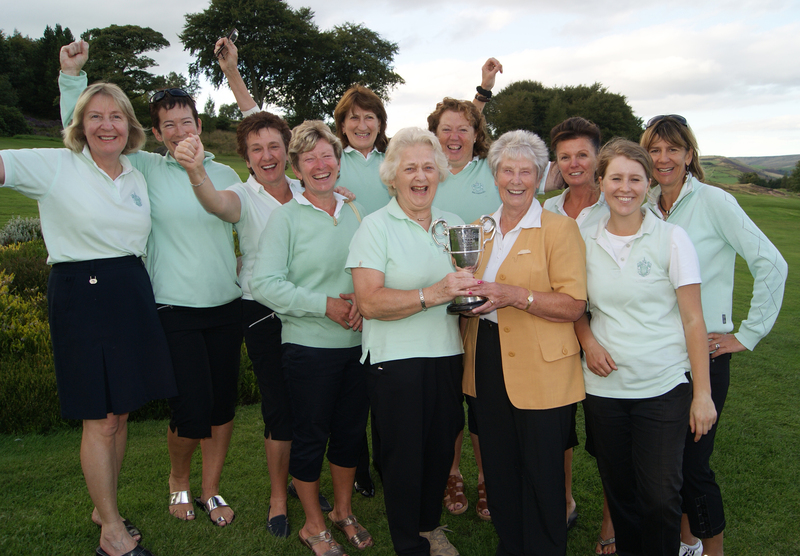 Cheshire took the team gross trophy for the scores posted by Caroline Berry, Gill Mellor and Liz Wilson with the Lancashire trio of Helen Braddock, Maggie Ayers and Jennifer Adams winning the team handicap trophy. The next day saw the opening match-play rounds reduce the field to the last four and the other players were able to enjoy a Team of Three Stableford competition. In the quarter-finals there were wins for Berry by 6&5 over Adams and Ruth Lindley, of Durham, overcame Lesley Marsh of Northumberland 3&1. The other half of the draw saw Cheshire in control as Prestbury’s Mellor beat Braddock (Bolton Old Links) 3&2 and Sandiway’s Barbara Laird cruised through 6&5 against Carolyn Kirk of Yorkshire. The team Stableford winners were the Yorkshire trio of Christine Hinchliffe, Helen Duckett and Sandra Paul from Cumbria’s Sue Cotter, Rosie Waller and Kathryn Bulman. So on to the finals day with the morning semi-finals seeing Berry emerge with a one hole win over Lindley to set up the final against Laird who beat county colleague Mellor 3&2. The final was a yo-yo affair as Barbara twice built up a two-hole lead only for Caroline to pull it back to be all square after 13 holes. Barbara again built up a two-hole cushion with wins at the 14th and 16th holes and an immaculate par on 17 saw her home by 3&1 to end her long sequence of runners-up slots. NORTH West trio of Emily Taylor, Brogan Townend and Charlotte Wild will represent England Golf in the Nations Cup event at the St Rule Trophy at St Andrews from June 2-3. Emily, 17, who lives in Chorley and plays at Royal Lytham & St Annes, has already tasted Nations Cup success this year – at the French Lady Junior Championship when she helped England win the Vilmorin Cup. She was also fifth in last week’s English women’s amateur championship at Royal Birkdale won by Bolton’s Kelly Tidy and is a past winner of the Scottish U16 open stroke play title. Brogan, an 18-year-old Pleasington member, is the reigning Faldo Series girls’ champion and has previously won the U16 title. She is a past winner of the prestigious scratch events, The Leveret and the Pleasington Putter. She and Emily were both members of England’s successful team at last year’s girls’ Home Internationals. Charlotte, 22, from Mere is the team captain (pictured image © Leaderboard Photography). She was the 2009 English stroke play champion and was runner-up in the event last year. She’s twice won the Royal Birkdale scratch trophy and tied eighth when the English amateur was held on the Lancashire links last week. She has represented England in the women’s Home internationals. BOLTON’S Kelly Tidy won a sudden death play-off to be crowned English women’s amateur champion at her home club, Royal Birkdale. She defeated Dorset’s Georgia Hall with a birdie on the first play-off hole after the two had tied at the end of regulation play on four-over par. “It’s very special to win here, it means more than anything,” said Kelly, whose supporters included a crowd of home club spectators. The Curtis Cup player set the stage when she took the championship lead after this morning’s third round when she produced a near-flawless score of four-under par 71. It took her to two-under for the event and leapfrogged her over her playing partner, Georgia Hall (Remedy Oak), who had held the lead from the start and who had scored par this morning. It meant there were three shots separating the pair as they teed off in what was to become a two-horse race. Their closest challengers were another six shots behind them and none could break into the battle being played out in the final pairing. 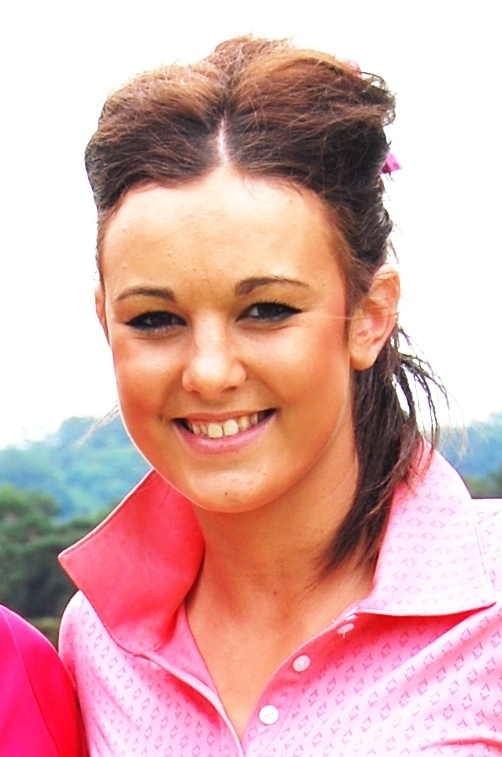 Holly Clyburn (Woodhall Spa) came nearest, finishing three shots back, in third place. Kelly maintained a healthy advantage over the opening holes and was four ahead after the fourth. But she was steadily pegged back and after a two-shot swing on the 10th, which Georgia birdied, the players were on level terms. Georgia kept up the momentum, taking advantage of a temporary lapse in Kelly’s putting skills, and held a two shot advantage after 14 holes. But the battle was far from over: Georgia’s three-putt on 15 narrowed the gap to one and when Kelly birdied 16 they were again on level terms. Georgia struck back with a birdie on the 17th to hold a one-shot lead as they played the last. Kelly, in turn, birdied the 18th – thanks to a superb putt of over 30 yards which finished within inches of the hole – to set up a play-off. Kelly’s next big date is the Curtis Cup match at Nairn next month: “I really hope we can win there. I love team golf and I’m very patriotic about playing for my country, it means a lot,” she said. The team also includes Holly Clyburn, who was third in the championship, while Georgia is a reserve. The best scores of the final round were three-under 72, returned by England girl international Emily Taylor from Chorley, a member of Royal Lytham & St Annes), and British champion Lauren Taylor (Woburn). Hannah Barwood (Knowle), Mere’s Charlotte Wild and Melissa McMahon (Lyme Regis) all shot one-under 74. 304 Kelly Tidy (Royal Birkdale) 78 74 71 81, Georgia Hall (Remedy Oak) 77 74 75 78. Tidy won sudden death play-off at first extra hole. SALE was in immaculate condition as it hosted the 53rd Ladies Mersey Shield, writes Geoff Garnett. It attracted almost 200 competitors from the five Mersey Valley clubs with the hosts claiming the honours after a close finish. With the last few players on the course Withington held a slight advantage but as usual the sting in the tail came from Sale’s last pair Gill Hayes and former junior captain Katy Rawthore who posted 33 points to lift their total to 211, five more than Withington. Chorlton were third place with 194 points from Didsbury 193, and Northenden 180. The winning scorers for Sale were Hilary Tarleton and Julie Matthews 38, Gill Ross and Janice Weyer 36, Annette Pilling and Judith Stanistreet 36, Sophia Casey and Sue Barrett 35, Caroline Williams and Jane Ashcroft 33, Katy Rawthore and Gill Hayes 33. Top scorers for the other clubs were Carol Nelson and Ann Culpan (Northenden) 38, Liz Bradbury and Judith Quine (Withington) 38, Brenda Chadwick and Claire Murray (Didsbury) 38 and Shirley Anders and Monica Parsonage (Chorlton) 36. It needed a card play-off on 38 points to decide the individual winners with Carol Nelson and Ann Culpan getting the nod over Hilary Tarleton and Julie Matthews, Liz Bradbury and Judith Quine and Brenda Chadwick and Claire Murray. BOLTON’S Kelly Tidy is one shot behind Dorset’s Georgia Hall after a one-under 74 in the second round of the Tourism Ireland-sponsored English women’s championship at Royal Birkdale. They pulled away from the field, with four shots separating Kelly from the group of four players who share third place including Manchester’s Gilllian Nutter and Chorley teenager Emily Taylor who plays at Royal Lytham & St Annes. Her score slipped back with four bogeys in a row from the eighth, but she settled again when she birdied the short 12th. “I made two bad swings today and they cost me two shots, but the other bogeys were fair. It’s tough out there, but it’s good to play in the wind, it’s a true test of links golf,” said Kelly, who is in the Curtis Cup team. BOLTON’S Kelly Tidy was left to rue losing a ball at Royal Birkdale’s short ninth hole in the Tourism Ireland-sponsored English women’s amateur championship at Royal Birkdale. It cost the Curtis Cup player, a member of the host club, three shots as she ended the first round one behind Dorset’s Georgia Hall who carded two-over 77 in brutal conditions. links. She played well, apart from her mis-club on the ninth where her ball carried the green and disappeareds. She was among five players in the chasing pack which included Heswall’s Rachael Goodall. Her game plan was steady play: “I just tried to play fairways, greens and two-putt for pars,” she said. She went better with birdies on the sixth and 13th and an eagle on the long 17th, where she holed a 35-footer for a three. 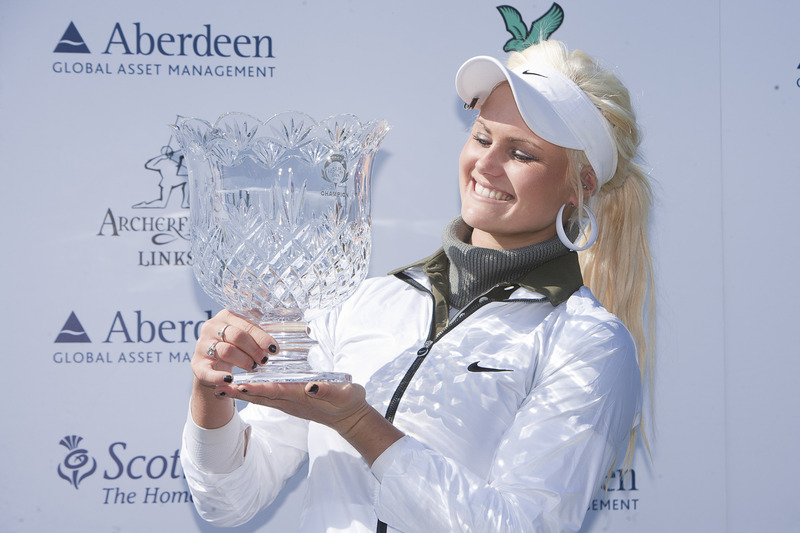 SCOTTISH teenager Carly Booth, who played for Lancashire Girls for two seasons, pulled away from a jammed leader board to win the Aberdeen Asset Management Ladies Scottish Open presented by EventScotland on a glorious final day at Archerfield Links in East Lothian. The 19-year-old from Comrie in Perthshire, whose mother hails from Liverpool, fired rounds of 70, 71 and 71 to end on a total of four under par 212, having played through near-freezing conditions earlier in the week. 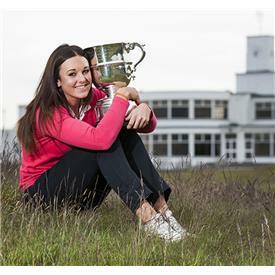 She ended a stroke clear of Royal Birkdale’s Florentyna Parker and Australian Frances Bondad. Barry Hume, who retired from playing on the men’s European Tour recently, was on caddie duties for the second successive year at the event and predicted that the 19-year-old would be a force to be reckoned with in the future. “She’s barely scratched the surface of her potential. I think this will be the first of many wins,” Hume said. She was playing with the 2011 event champion Catriona Matthew, who ended in a share of 20th position and felt that she had played well, but with too many loose shots over the first two days to launch a fight back. NATALIE Lowe held on to her Cheshire Women’s Championship crown at Heswall but was taken to the third extra hole by the county junior captain Gemma Clews, writes Geoff Garnett. The 17-year-old Delamere Forest player showed her intent on the first day of the 36-hole qualifying competition to win the Doris Brown Trophy with her rounds of and 71 seeing her eight shots clear of Royal Liverpool’s Emma Goddard who took the Millennium Scratch Trophy as the top Intermediate with her second round 73. Gemma’s scores also saw her drop her handicap to plus one and in the first round of the matchplay round she saw off Astbury’s Lauren Oleksik 5&4 to set up an epic match with Poppy Finlay, from Vicars Cross. Poppy led by three holes with four to play but Gemma showed her battling qualities to force the tie into extra holes with a birdie after driving her tee shot on to the 278-yard 18th hole. The match went to the 24th hole before Gemma again drove the green on the par four 297-yard sixth and holed her putt for an eagle to reach the last four where she enjoyed a 6&5 win over Styal youngster Charlotte Leathem to secure her place in the final. In the other half of the draw Natalie made smooth progress with wins over Sara Spencer (Heswall) by 3&2, Caroline Berry (Bromborough) 2&1 and Emma Goddard 3&2. Then came the cliff-hanging final with Natalie, also from Styal, going through to retain her title against Gemma who had played some amazing golf which included eight birdies in the first round and five in the seconds plus a few eagles. The players knocked out in round one of the match play final competed in the subsidiary competition for the Sir William Bailey Cup which was won by Sale’s Cath Rawthore who beat Jeanne Bell of Royal Liverpool by 5&4 in the final. The squad for the Northern Counties championships at Ganton is: Gemma Clews, Abbie Cowlard (Reddish Vale), Hannah Davies (Bramhall), Poppy Finlay, Rachael Goodall (Heswall), Bronte Law (Bramhall), Charlotte Leathem and Cath Rawthore plus reserves Claire Fry (Royal Liverpool), Gill Mellor (Prestbury) and Jo Fish (Royal Liverpool). 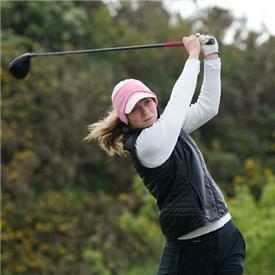 FORMER Lancashire players Carly Booth and Florentyna Parker share the lead with South African Stacy Lee Bregman heading into tday’s final round of the Aberdeen Asset Management Ladies Scottish Open presented by EventScotland. The trio are locked at three-under- par having played 36 holes in near-freezing conditions at Archerfield Links in East Lothian. Parker’s 69 was the best round of the day and included an eagle at the par-five sixth hole, while Bregman and Booth shot rounds of 70 and 71 respectively. Tara Davies of Wales had a 72 sits alone in fourth place on two under, with Italian Diana Luna and first-round leader Anne-Lise Caudal of France a shot further back on one under par. A FORMER Lancashire driving instructor-turned-aspiring PGA professional Sarah Walton is revving up for golf’s fast lane having hit top gear. The one-time Lancashire County ladies amateur, based at Accrington & District Golf Club, is celebrating having sped to pole position among her second year peers on the three-year PGA Foundation Degree. 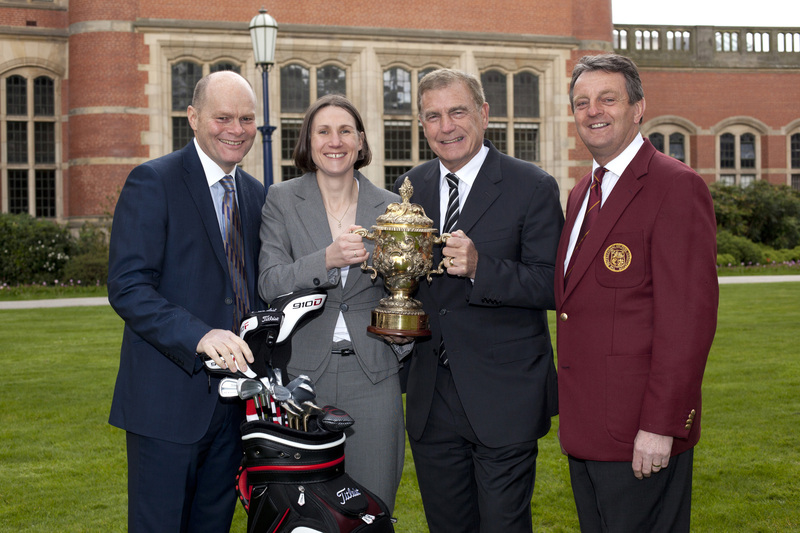 The 35-year-old, who first picked up a club in her late teens, admitted she was ‘over the moon’ as she was presented with the Lord Derby Trophy and a cheque for £1,000 by England football legend Sir Trevor Brooking, who was the guest of honour at the PGA Graduation Ceremony held at the University of Birmingham. Walton, who was runner-up in her rookie year, said: “It’s always nice to get recognised for the hard work you put in. “I didn’t take up golf until I was 19 and never really thought about being a golf professional and then my friend Karen Heywood, who is at Crompton & Royton, talked me into doing it at the same time as her, so I had a look at the course. Walton explained her introduction to golf having been a competent badminton player. “I had a friend who was a head greenkeeper and he was a fantastic golfer playing off three or four,” she said. “I should have been doing my A levels at the time, but I got a tad obsessed with golf after he had taken me to the driving range to give it a go. He was a good guy and made sure that I did stuff the right way and learned about the game, rules, etiquette and so before even getting on a golf course. 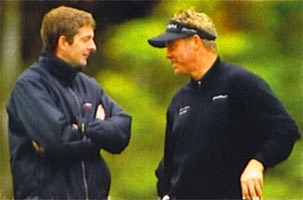 “I had the bug and then joined a Green Haworth, a nine-hole course, before moving to Accrington. But being a professional wasn’t in mind as I did loads of jobs, working with kids, in a post office and then being a driving instructor from 2004. The PGA training programme, which was founded more than 50 years ago, concentrates on all aspects of golf including business, equipment technology and repairs, rules and tournament organisation, sports science, sports psychology and playing. Training and education remains an integral part of the PGA with the foundation degree, while the PGA also runs an honours degree in association with the University of Birmingham. Once qualified, PGA members also undergo a process of continual professional development to keep them up to speed with all the latest developments in the sport. PGA chief executive Sandy Jones said: “The PGA Graduation Ceremony at the Great Hall of the University of Birmingham has now earned its place as one of the most enjoyable and inspirational days in the PGA calendar. “On this day we are able to celebrate men and women completing their PGA training programme and becoming qualified as the next generation of PGA members. “I always feel enormously proud of these graduates as I know they have all worked extremely diligently during their training years to achieve their PGA qualification. “Of course the graduation day will not be the end of the story but only the opening to the next chapter of their career as a PGA professional. At this time golf is expanding across new frontiers throughout the world and it will indeed be many of today’s graduates who will take the game forward and successfully grow it within these new territories around the globe. Ken Graham, Titleist director of sales, said: “We are pleased to continue our support of the Titleist PGA Assistant of the Year award, recognising this as a starting point of the PGA’s commitment to provide its members with a framework for lifelong learning. TWO new clubs have joined the drive to encourage more women to take up golf in Cheshire. Alvaston Hall Golf Club and Poulton Park golf clubs are both staging coaching programmes for would-be lady golfers. The schemes are part of the county-wide programme to provide more opportunities for people to try the sport. The free coaching sessions will be held over an eight week period at the two clubs. Further details are available from PGA professionals Mark Taylor at Alvaston Hall, near Nantwich, (01270 628473) and Freddi Valenti at Poulton Park at Warrington (01925 825220 Option 2). “Often the thought of approaching a golf club can be a little bit daunting, but these sessions are a great chance to meet new people who are trying the sport for themselves. AMY Boulden, a member of the Great Britain and Ireland Curtis Cup team for June’s biennial battle with the United States at Nairn, showcased her talents by winning The Leveret at Formby Ladies by two shots. The Maesdu member followed up brilliant opening round 64 with a 70 as her Welsh international team-mate Chloe Williams, from Wrexham, claimed second place. Rachael Goodall, from Heswall, finished third six strokes off the pace while two further back was her Cheshire clubmate and rising star Poppy Finlay, from Vicars Cross who tied with Tadcaster’s Charlotee Austwick. REGIONAL players Nikki Foster, from Pleasington, and Heswall’s Rachael Goodall, are in the three-strong England women’s team for the European Cup of Nations at Sotogrande on March 21-24. Bramhall player Bronte Law will join forces with Pleasington’s Brogan Townend and Chorley-based Royal Lytham member Emily Taylor in the squad for the French Lady Junior Championship at St Cloud, from April 5-9. 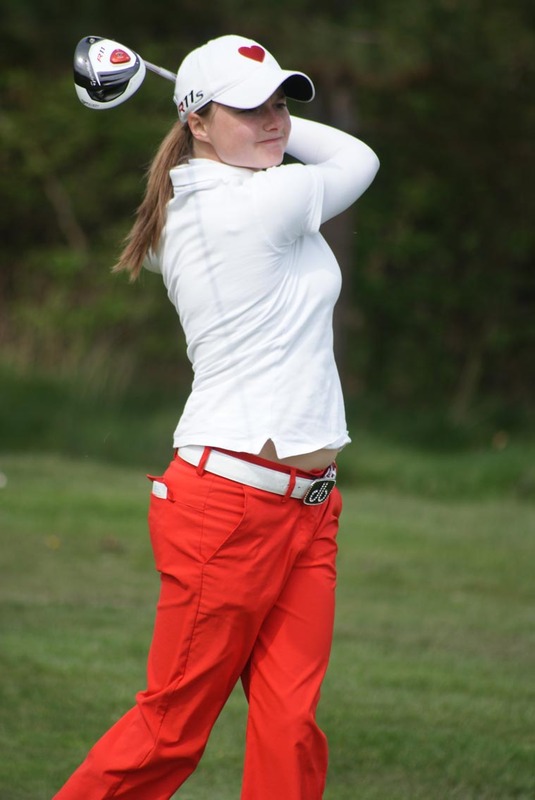 And Lancashire women’s champion Emma Harris, from Isle of Man club Peel, is in the England squad for the Scottish U16 strokeplay Championship at Strathmore on April 12-13.
manager. She is without doubt the most successful captain of the Welsh ladies’ international team, having masterminded successive Home Internationals victories in 2008 and 2009. She remained in the position of Team Captain to the present day. Sue’s reputation as a highly-respected and very effective player motivator brought her to the attention of the LGU, resulting in an invitation in 2007 to Captain the five-strong GB&I team for the quadrennial Five Nations (former Commonwealth) Trophy Tournament in South Africa. Unsurprisingly, she led her players to victory against teams from Australia, Canada, New Zealand & South Africa. One of Sue’s key strengths was in knowing her players better that they knew themselves. As a captain, manager, international selector and general golf enthusiast, she probably spent more time with her players, both on and off the course, than almost anyone else in ladies’ amateur golf. With a passion for developing young players, Sue was delighted to have the opportunity to Captain the GB&I under-16 girls team in the inaugural Junior Vagliano Trophy match against the Continent of Europe last June at Royal Porthcawl Golf Club in her home country of Wales. At the time of her death, she was still fully committed to team golf, serving as manager of the GB&I team which is due to play in the 37th Curtis Cup match against the United States at Nairn on June 8-10. Shona Malcolm, the LGU’s CEO, said: “Ladies’ golf in Great Britain & Ireland is poorer today following the loss of Sue Turner. Her enthusiasm and love of life were infectious and permeated through every team she worked with. She gave us so much, and had so much more to give. Motivation indeed for the 2012 Curtis Cup team. Sue’s pride in her home country and her teams were renowned, but her proudest golfing moment happened last year at Strathmore Golf Club, where she watched her daughter, Lottie, pull on her red Welsh team jumper for the first time. Sue is survived by her husband, Mike, and Lottie, in Sue’s own words her “two favourite people.” The thoughts of everyone at the LGU are with Sue’s family. 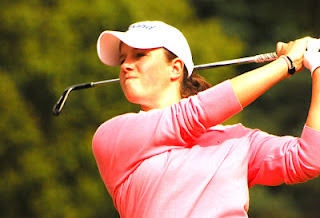 the Scottish U16 strokeplay champion and Kelly Tidy, 19, won the 2010 British Championship and was a semi-finalist last season. They were also members of England’s winning team at the 2011 Ladies’ Home Internationals. And Bronte also helped England girls win a European championship silver medal and was in the winning team at the girls’ Home Internationals. The players, watched by team captain Tegwen Matthews and the LGU International Selection Panel, will take part in a three-day team trial over Nairn’s championship links on March 23-25. The team and reserves will be announced on March 27. KARL Morris, the Manchester-based sports psychologist whose clients include Open champions Darren Clarke and Louis Oosthuizen and US Masters winner Charl Schwartzel and former World No 1 Lee Westwood, played a part in helping Jodi Ewart, Charlotte Ellis and Tandi Cunningham gain their Ladies European Tour cards last week. Jodi, from Yorkshire, was the overall winner and has also gained her US Tour card.Morris said: “I worked with her as a youngster at Catterick and with her swing coach Andy Marshall but then began helping with her again about six months ago when she was at a United States at college. “We communicated via Skype. It has been tremendous to see her turn things around because a few months ago she had got pretty down about her game and lack of progress. 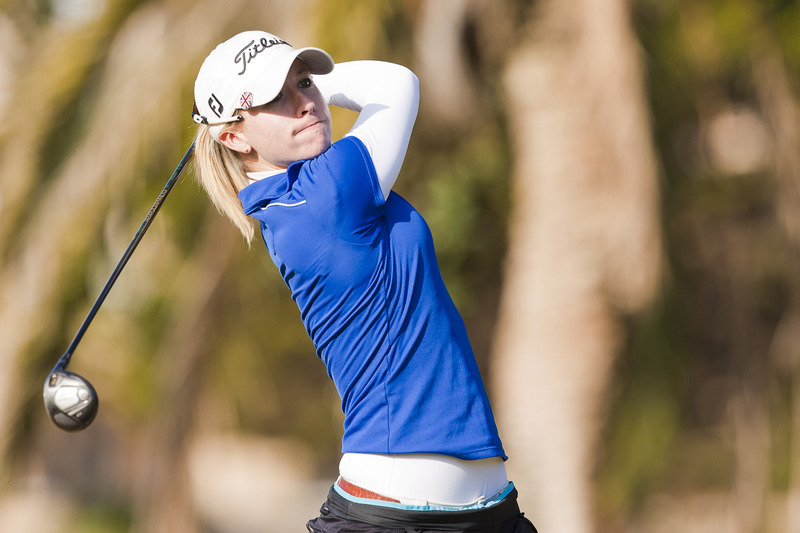 ENGLAND’S Jodi Ewart continued to lead after the fourth round of the Ladies European Tour’s Final Qualifying School at La Manga Club as 52 players made the cut, securing their places in the fifth and final round. Today’s penultimate round represented a chance for the 99 competitors in the field to make a break towards the top 50 and ties and the magic number fell at nine over par. But there was no joy for Bolton-based Kelly Tidy and Manchester Hopwood’s Rachel Connor. Tomorrow the remaining competitors will be targeting the crucial top 30 places and membership of the LET in category 8a. Those who finish in positions 31 to 52 will be eligible for Membership in Category 9b, but with fewer chances to play. As always at qualifying school, there was drama at the top and bottom of the leader board as the players jostled for position. At the top of the leader board, Ewart’s overnight lead was cut from seven to four shots, after Swiss amateur Anais Maggetti fired a six under 67 on the South Course to end the day at seven under par. At the other end of the leader board, Russian Maria Verchenova was one of the players who climbed up into the top 52 places moving from tied 55th into a share of 43rd with a one under par 72 on the South Course, but Scotland’s Lynn Kenny went the other way, slipping from tied 49th into joint 76th with a 78 on the North. YORKSHIRE hot-shot Jodi Ewart blew away the rest of the field with a six-under-par round of 67 in windy conditions in the third round of the Ladies’ European Tour Final Qualifying School on the South Course at La Manga today. The 24-year-old fired six birdies to lead by seven strokes on minus 13 with two rounds to play. Manchester’s Rachel Connor returned a 76 at the south course to tie 49th as Royal Birkdale member Kelly Tidy, from Bolton, carded 80 on the north course to share 75 place. Ewart was one of only nine players in the field to break par on a cold and blustery third day in Cartagena, Murcia. and she explained: “I felt like I had a little bubble around me today, actually. I’m pretty experienced in the wind. “We seemed to play a lot in the wind on the Futures Tour and in college. New Mexico is really windy in the spring. Obviously being from England too, I have a lot of experience in the wind and it only really started raining on the last hole. Ewart, who earned her full card for the LPGA in December, has chosen not to look at any leader boards during the qualifiers. “I’m taking each shot and each hole at a time. I’m really enjoying playing golf out there,” she said. The fifth round will be played on the South Course on Thursday and the top 30 players will earn LET Membership. total of 137. The former Great Britain and Ireland Curtis Cup player is now poised to achieve a dream double after earning her LPGA Tour card in December. She ended the day a stroke ahead of three other players. French amateur Alexandra Vilatte, the first round co-leader Sharmila Nicollet of India and Heather Bowie-Young of the United States were all on six under par. Spain’s Carlota Ciganda and Marjet Van der Graff from the Netherlands finished a stroke further behind in a share of fifth place, followed by Scotland’s Clare Queen and Thailand’s Piyathida Ployumsri on four under par. Meanwhile, Manchester Hopwood’s Rachel Connor carded a 76 over the North course to share 21st place. But Bolton’s Kelly Tidy returned 79 at the South Course to slip to 79th. The first four rounds end with a cut to the leading 50 players who will battle for one of the 30 players cards. INDIA’S Sharmila Nicollet and Chrisje de Vries, of the Netherlands, set a flying pace with rounds of five-under-par on the opening day of the Ladies European Tour’s Final Qualifying School at Spanish resort La Manga Club. Bolton’s Kelly Tidy carded 74 on the North. Meanwhile Nicollet had seven birdies and two bogeys for an opening 68 on the South Course while De Vries had four birdies, one bogey and an eagle two at the ninth hole in a 66 on the North Course. England’s Jodi Ewart, Germany’s Stephanie Kirchmayr, Sweden’s Elin Emanuelsson and Spain’s Laura Cabanillas were the next best placed players on three under par. The 90-hole Final Qualifying School is being played over the resort’s two world-class courses for the first four rounds with a cut to the leading 50 players and ties after 72 holes. The fifth round will be played on the South Course on Thursday and the top 30 players will earn LET Membership in category 8a. BOLTON teenager Kelly Tidy has cleared the first hurdle in the Ladies European Tour qualifying school marathon and graduated to the final stage. She was among 72 players who made it through pre-qualifying at the La Manga Club in Spain where they will return on Sunday for a five-round test and aiming to finish in the top 30 and win a place on the 2012 Tour. England international Tidy, a Royal Birkdale member, tied eighth with scores of 74 72 72 73. DISTANCE measuring devices are to be allowed in all English national women’s championships and competitions. 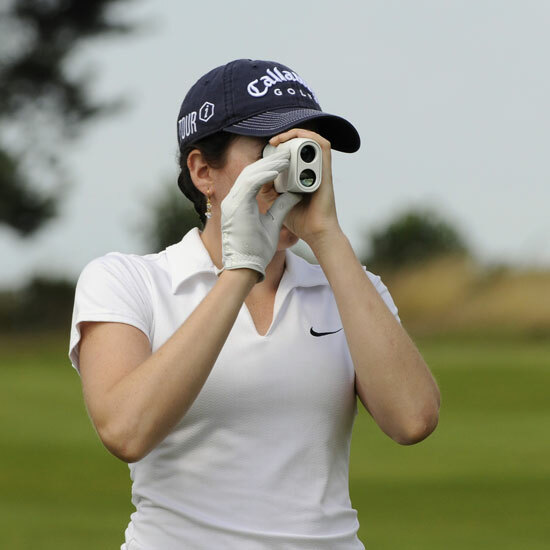 Until now, competitors have been allowed to use DMDs in English Women’s Golf Association (EWGA) events at club level. However, they were not permitted in national championships, nor in the regional and national finals of handicap competitions. Many players found the situation confusing and EWGA received many questions asking why DMDs were not allowed in all its competitions and, specifically, why men could use them when women could not. After giving full consideration to the matter, the EWGA Operational Board decided that DMDs could be used in all its events. The decision was made at the board’s final meeting before the association merged with the English Golf Union (EGU) to form England Golf. The EGU already allows the use of DMDs in all its events. Individual county women’s associations will continue to make their own decision about whether or not to allow the use of DMDs in their events. the LET Qualifying School at La Manga Club. The 19-year-old former British women’s open amateur champion from Bolton is hoping to win her card at the first attempt along with fellow England player, Mere’s Charlotte Wild, and Lancaster’s Holly Calvert. Four pre-qualifying rounds start on Sunday with the final on January 15-19. BOLTON hot-shot Kelly Tidy, vowed to use the lessons learned in the Ladies European Tour Access Series in the Azores to get her through next month’s LET Qualifying School at Spanish club La Manga Club in Spain in January. The 19-year-old former British women’s open amateur champion finished second a stroke adrift of Marieke Nivard, of the Netherlands, who came from six shots behind in the final round. “It was a hard day. I knew that I was holing all the putts in the previous rounds and that one day they would not get in so easily and that day was today,” said Kelly, a member at Royal Birkdale. “You have to make the putts in order to win and I did not make any. I never thought I had it lost but I saw Marieke was playing really well and that I needed a level par round or a one over to win. I saw the leaderboard on the 15th and for me it is important to know the scores, but I couldn’t make it. LORA Fairclough has wasted no time carving out a new career after retiring from the Ladies European Tour at the end of the summer. The former Solheim Cup player is passing on her considerable experience by working as a coach at the Chilli Dip Academy a few well hit drivers from her Adlington home. She started playing as an 11-year-old at Chorley Golf Club and as an England International represented Great Britain and Ireland in the Vagliano Trophy. The four-time Tour winner is also channelling some of her energies into the Lancashire Women’s Golf Association, which played an important role in developing her burgeoning talents, by joining forces with training officer Anne Baines. “I feel the need to put something back into the county,” said Lora, who was invited to join the staff at Chilli Dip by owner James Barr. He and fellow professional Phil Newnes have helped to set up her own teaching bay at the driving range which includes video technology and they have recently recruited former Bolton champion Liam Ball as a trainee. They’ve also a captive audience because the academy is part of the 500-member Douglas Valley nine-hole golf course. Meanwhile, Lora will restrict her playing opportunities to corporate pro-ams in Spain and Portugal. IT’S ladies first for a new scheme being run by Alvaston Hall Golf Club. 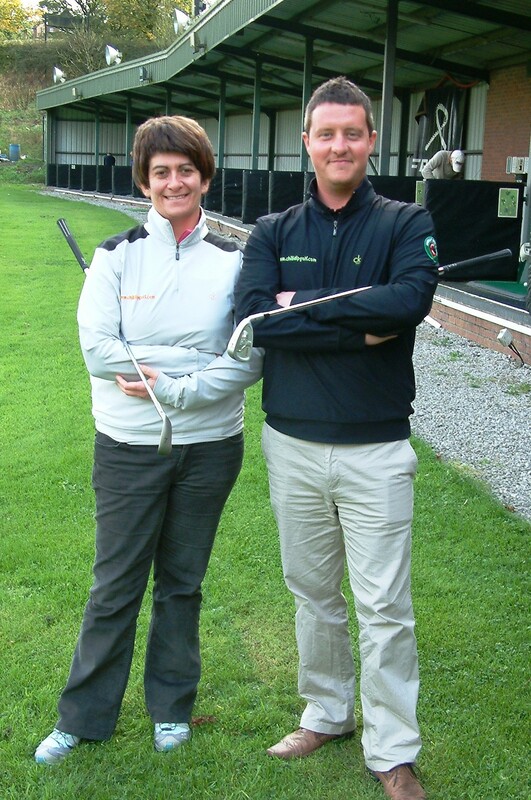 The Cheshire club’s PGA qualified professional Mark Taylor is running a series of free group lessons for women. They will take place at the club, near Nantwich, both before and after Christmas and will help anyone looking to take up the sport or develop their skills. They form part of a county-wide drive to encourage more people to take up golf, and particularly women. “It can be intimidating for a women or girl to approach a club on their own to start playing golf,” said Craig Thomas, county development officer for the Cheshire County Golf Partnership, “but the Alvaston Hall sessions provide a great place to join in with groups of people who are in a similar position. Further details are available from Mark Taylor be emailing mark.taylor72@o2.co.uk or ringing the club on 01270 628 473. ENGLAND beat hosts Ireland 4-3 in dramatic style and successfully defended their Senior Home International crown with three wins from three matches at Tramore. The two teams were locked in a tight title showdown and appeared to be heading for a halved result. It meant England would retain the trophy, but they dearly wanted to win it outright – and Cheshire’s Caroline Marron produced a grandstand finish to secure the victory. She was one down when she played a nine-iron stone dead into the par five 18th and her birdie putt was conceded. By winning the hole she contributed the crucial half to the England scoreline. “We are ecstatic, we are in the pink!” said team captain Hilary Smyth, in a reference to England’s colours. “It was such a tight match and what a finish! We knew we would retain the trophy when Janet Melville produced a miracle half – but we wanted to actually win the title, not just retain it. The victory gives England an impressive hat trick of 2011 Home Intemational titles, after the successes of the girls’ and ladies’ teams earlier in the season. The senior celebrations came at the end of a long day’s play in torrential rain. This morning, the players from all four teams returned to the course to complete the second session of matches. Play had been suspended yesterday because of thick mist, leaving the singles uncompleted. England, who were playing Scotland, had the upper hand when play was called off, having won the three foursomes and taken the lead in three singles. They maintained their form when they returned to the course and went on to win the singles 4-1, giving them an overall scoreline for the match of 7-1. In the other match, Ireland defeated Wales 5-3. This meant both England and Ireland had two wins from two matches and their head-to- head in the final session became the decider. Because of the yesterday’s delays, the match was played over seven singles, involving all team members, rather than the usual format of three foursomes and five singles. Bev New (Lansdown) & Chris Quinn (Hockley) beat Lorna Bennett & Karen Ballantyne 1 up. SADDLEWORTH provided a magnificent stage both on and off the course asthey hosted the final of the MDLGA Bell Cup. It is the home club of MDLGA President Sonia Dunn and she and her team from Saddleworth and the MDLGA led by Bell Cup organiser Jackie Foy ensured that the day ran like clockwork with excellent weather enhancing the fantastic views offered by one of the highest altitude clubs in England for the four teams – Mere, Warrington, Turton and Northenden –and their enthusiastic supporters to enjoy to the full. Northenden with two games going to the 18th hole to meet Turton, who won by a similar margin against Mere to ensure new names on the trophy which has been competed for over 100 years. Warrington got off to a flier with young star Loren Halliwell and Jean Warburton winning by 3/2 and 4/3 respectively. Then the ‘Turton Tiger’ Jessie Baxter, believed to be the oldest player ever at 76 years young, off a fine 12 handicap, to compete on finals day notched up her second win of the day by 4/3 over Liz Faulkner. Jennifer Hart posted the third win for Warrington by 2/1 over Elaine Hayes only for Christine Gobin to get Turton back in the hunt with a 6/4 success over Sarah Loy. Denise Power clinched victory for Warrington by 4/3 over Christine Studholme to set up the celebrations with Dorothy Campbell conceding her match to Turton’s Lynn Evans to complete a great day of excellent golf played in a great sporting spirit that was a credit to both teams. Presenting the coveted trophy in a competition that had 89 clubs in the original entry and involving hundreds of top players for the participating clubs MDLGA President Sonia Dunn gave fulsome and deserved praise and thanks to all who had contributed to make this a real day to remember for everyone who took part. 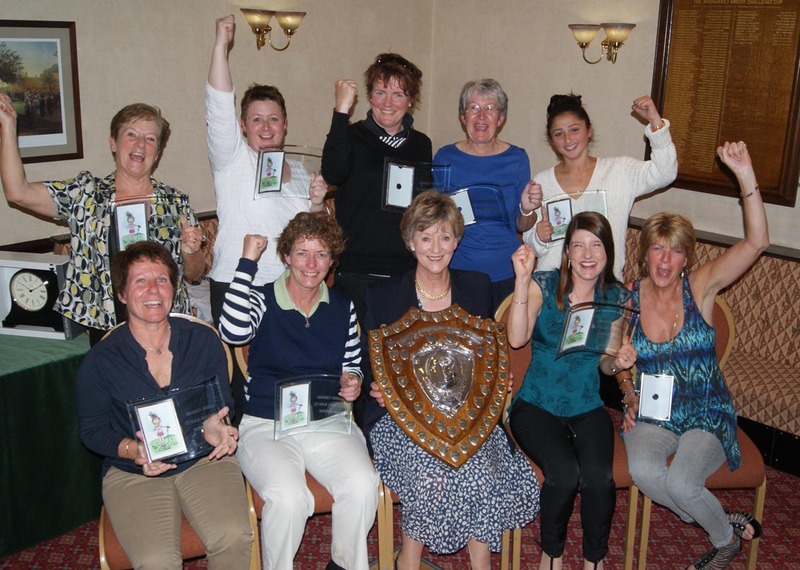 ANOTHER busy season for the East Cheshire Ladies Leagues was concluded in a great day of finals at Ringway Golf Club. Well over 100 teams in the four different leagues compete each week during the summer months aiming to top their respective divisions and reach the knock out stages. The winners and top runners-up then go through quarter and semi-finals to reach the finals day with the Business Ladies League final being played on the day before the main event. Stockport were the winners by 3-0 over Dunham Forest to set the stage for the A and B and Plate finals for the following day. Astbury were the first team to celebrate as they beat Warrington 4-3 with wins from Gill Riley, Chris Westrup, Cathy Day and Gill Hodges to take the coveted shield back to south Cheshire. But Warrington, already holders of the MDLGA Bell Cup, gained ample consolation as they took the B team Shield with a 4-3 win over Mere as wins from Ann Taylor, Denise Power, Marie Stacey and Di Scholes saw them home. Finally there was history made for Marple in the Plate final as they made their first-ever appearance at this level against Prestbury who were also looking for a maiden victory at this level. But it was Prestbury who had the edge as they won the first four matches with Liz Dunkley, Janet Higson, Kirsten Forbes and Elaine Fawkes taking charge with comfortable victories. Each team was presented with their trophy by Cheshire Captain Win Heath of Hale GC who along with the various Lady Captains paid tribute to Ringway Golf Club, their teams for a great effort over a long season and to Judith Mutter of Macclesfield GC and her team of helpers for the superb organisation of the leagues and finals. More glory came for Astbury and Warrington as they took on the West Cheshire League winners at Crewe a week later. Astbury are the new Cheshire A champions after beating Runcorn and Warrington completed a great season for their club as they beat Vicars Cross in the B team final to win their county title. A MAJOR new drive to bring more girls and women into golf is being launched across Cumbria. Eight clubs have signed up to deliver a six-week course of free lessons.These are aimed at those who are new to the game, or who want to return to the sport.Says Jane Robinson, county development officer for the Cumbria County Golf Partnership: “This is an ideal chance for any girls or women who have thought about trying golf – and it’s all for free. “Sometimes the thought of going along to a club for the first time can be a bit daunting, but this is an opportunity to try the sport in the company of others. “It would suit an individual who wants to try golf, a family group or friends who are looking to take up a sport that will help contribute to a healthier lifestyle, while providing an active social life as well. “For some women, work and family commitments may have meant they no longer had the time to play a sport they enjoyed while younger and this scheme offers a great route back into golf for anyone looking to return. Anyone interested is asked to contact the club below they wish to attend directly. All equipment is provided. DEFENDING champions England made the best possible start to the Senior Home Internationals at Tramore, Ireland, when they beat Wales 8-0 in challenging conditions. The course was covered by a localised sea fret throughout the day and play had to be suspended for half an hour in the afternoon. But it seemed nothing could stop the team. England gave notice of their winning intentions in the morning foursomes. The new pairing of Chris Quinn and Bev New was an immediate success as they won the first five holes and romped to a 7/6 victory. They didn’t lose a hole in the match. The other two matches were much tighter but strong finishes from Sue Dye and Caroline Marron and from British senior champion Felicity Christine and Janet Melville secured both points on the 17th. The singles, which included Roz Adams, were all well contested with two ending on the 16th, two on the 17th and one on the 18th – and all in England’s favour. “The physical conditions were very trying, especially with the dampness in the ground,” said Hilary. In the day’s other match the hosts, Ireland, beat Scotland 5-3. Tomorrow, England will play Scotland. PLEASINGTON’S Brogan Townend was crowned girls’ champion at the Faldo Series Grand Final, played in strong winds at the Lough Erne Resort in Northern Ireland. The England international, whose father Simon is a professional at Wilpshire Golf Club, will be offered a start in a professional Tour event and an invitation to the sixth Faldo Series Asia Grand Final at Mission Hills Golf Club in China next March. This is Brogan’s second major Faldo success – in 2009 she won the girls’ U16 title when the Grand Final was held in Brazil. 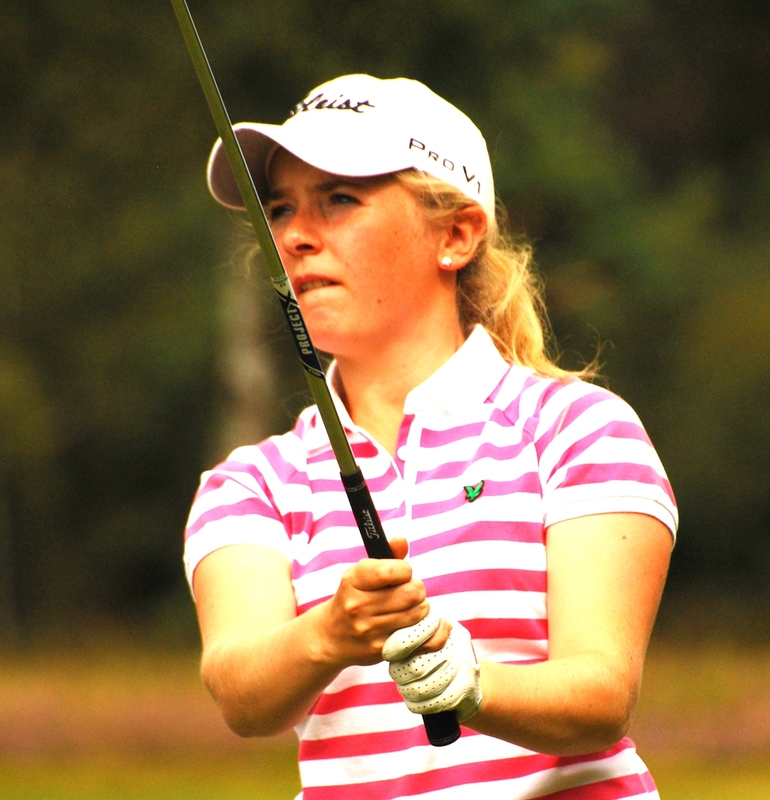 Brogan, 17, signed off in this championship with a one-under par 71 to overtake Natalia Heckova of Slovakia. The runner-up to Brogan in the U21 girls’ section was Meghan MacLaren (Wellingborough), followed by Steph McEvoy (Old Fold Manor), while Amber Ratcliffe (Royal Cromer) was runner-up in the girls’ U16 section. During the Grand Final, competitors attended clinics with six-time major champion Sir Nick Faldo and past winner Rory McIlroy. More than 30 local schoolchildren also visited Lough Erne to meet Faldo and enjoy an introduction to golf. A field of 77 players competed on the Faldo Course at Lough Erne. Sixteen different countries were represented by some of the world’s top young golfers, boys and girls, aged 13 to 21. LANCASHIRE, winners two years ago, had to settle for second place behind Lincolnshire in the English Women’s County Finals at Thorndon Park, Essex. The Red Rose side beat Northamptonshire 8-1 on the final day, pipping Gloucestershire by half a point, but their s bid for glory had been derailed earlier in the week when they halved with Gloucestershire and then lost to Lincolnshire. LORA Fairclough has sunk her last putt on the Ladies European Tour. “It is time to go,” said the four-time winner and Solheim Cup player who joined the professional ranks 20 years ago following a sparkling amateur career. “I’ve been suffering from a knee injury from a skiing accident which kept me out of action last season and despite two operations it’s still not right and that accelerated my decision. Lora, 41, is back in her Adlington home after a brief spell living in West Sussex and is embarking on a second career as a coach, expanding her public speaking engagements and playing pro-ams. But her main ambition is to try to attract more youngsters, especially girls, into the game. “It’s shameful that clubs have so few junior members,” she said. Her own roots are firmly planted at Chorley Golf Club where, encouraged by her dad Gerald, she picked up her first club when she was 11. In her rookie LET season she won £9,000 and by 1993 had trebled the sum, thanks to her maiden victory in the IMB Open which earned her a place in the European team for the biennial Solheim Cup match against the United States the following year. Despite Mickey Walker’s side losing 13-7 at West Virginia resort The Greenbrier, Lora won her foursomes and fourball matches with Dale Reid before succumbing to Kelly Robbins in the singles. She had plenty of experience on that score through her amateur days, as a girl and full England international and representing Great Britain & Ireland in the Vagliano Trophy in 1990. She was also England Girl and Intermediate champion and won the Northern title twice and the English Schools’ crown. But it was as a Lancashire player that Lora first made her mark, claiming the county championship on two occasions. “I owe a lot to the people who helped me in those early days,” especially my coach Howard Bennett,” she reflected. Back on tour, 1995 was her most successful season, winning the Ford Classic and European Masters and banked more than £81,000 as she achieved her best ranking of four. She also won the German Open in 1998 and three minor tournaments. Distance measuring devices (DMDS) are to be allowed in all English national women’s championships and competitions, with immediate effect. Email:lyndsey.hewison@ntlworld.comEditors NotesOn January 1st 2012, the English Women’s Golf Association merged with the English Golf Union to form England Golf, the governing body for all amateur golf in England.England Golf is one of the largest sports governing bodies in England looking after the interests of over 1,900 golf clubs and 770,000 men and women club members. Responsible for the training of the country’s top amateur golfers, England Golf also organises all the major English amateur championships. England Golf works to actively encourage new golfers and increase the continued interest and participation in golf through its golf development initiative ‘Get into Golf’. I had the privalege of caddying for Lora at the tytherington club when she needed a high finish to make the solheim cup team.Im convinced she would have won if her mind was not on the solheim cup.She achieved her goal and a top five finish saw her make the trip to the greenbrier.A fantastic player, person and competitor. Good luck in whatever your future holds.Im sure any goals you set yourself will be achieved with ease. Ah, I remember that day well! I was reporting on the event and was one of the first to congratulate my clubmate Lora!